Priyanka Chopra and husband Nick Jonas not only love each other’s cultural differences but also respect them. Despite having a hectic schedule owing to several work commitments, this lovely couple is leaving no stone unturned to spend as much quality time together as they can. And they also make sure to take out time for each other’s families. Recently we saw Nick flying down to India to attend the engagement ceremony of wifey Priyanka’s brother Siddharth Chopra. Then we also saw them having a gala time with their friends and family in Miami. Amidst all this, we came across the reports of Nick and Priyanka heading for a divorce. PeeCee’s spokesperson eventually refuted all the reports. Contrary to these nasty rumours, Priyanka is having a great time with her hubby and in-laws. The ‘Barfi’ actress attended her first ever Jonas Brothers concert and obviously, she loved it to the bits. 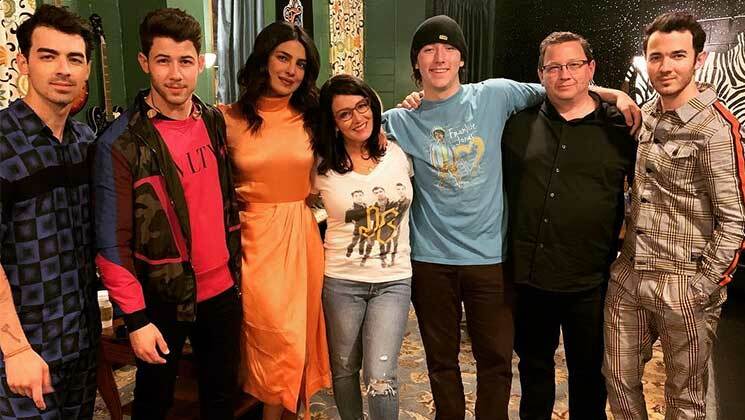 Taking to her Instagram handle, PeeCee even shared a few backstage pictures with the Jonas Brother and described her experience as ‘Incredible’. She even shared a video clip arriving for the concert. PeeCee even shared how proud she is of her hubby Nick and his brothers in the following clip. Interestingly the ‘Quantico’ actress featured in the Jonas Brothers’ comeback video ‘Sucker’ which is still topping the charts. We would love to see our desi girl feature in more such upcoming videos of Jonas Brothers’.